2015 ended on a high: 40C + to be precise. Botswana and the rest of southern Africa is currently experiencing the worst effects of El Nino, namely severe drought; to say we are desperate for rain would be an understatement. This being said, our last two family safaris of the year could not have been better. 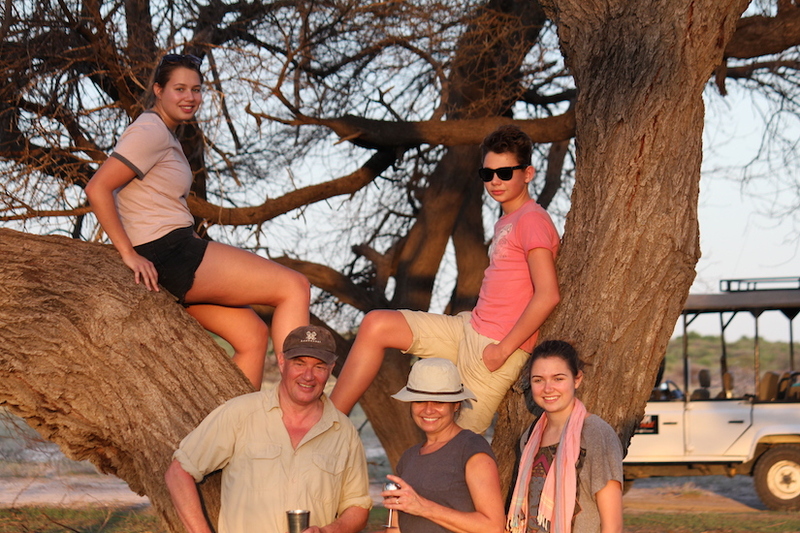 Having left behind a deluge of rain in the UK, the Webster family of five arrived to the shimmering heat of Maun, and were delivered gratefully to the leafy shade of the Royal Tree Lodge for two nights in order to acclimatise and prepare for the test which lay ahead – six nights in the Central Kalahari Game Reserve. The remote and scorching CKGR, as it is known to the locals, is not for the faint-hearted. Fortunately, the African continent is not new to the Websters; Jane had previously travelled with David down the length of Africa in a Bedford truck, and Julian had spent many a year in East Africa nurturing an addiction to birds and wildlife. Thankfully the Webster teenagers appear to have inherited their parents’ adventurous genes, and they rose to the challenge admirably. Steering our way down a thick sandy slope into the heart of the Deception Valley (made famous by Mark and Delia Owens in their book “Cry of the Kalahari”) in an open game drive vehicle, it seemed there was simply nothing there. The air hung thick and still around us. The journey in had been arduous, monotonous and hot, and an iced gin and tonic and cold shower seemed the ultimate, but unrealistic luxury. What a welcome sight to find our own private camp established and ready: mini meru en-suite tents squeezed under any shred of shade. Drinks were on ice, and bucket showers ready to cool us all down before we settled down to our first balmy evening dining under the stars. The next three days were as beautiful as they were brutal. Clouds gathered with the promise of an epic Kalahari thunderstorm, only to dissipate with the first gust of wind. We felt tantalised and tortured in equal measure. Our exceptionally early starts to avoid the worst of the midday heat were richly rewarded by some magical game sightings, including several African wildcat, innumerable black-backed jackals, curiously entertaining ground squirrels and the best bat-eared fox sightings I have yet witnessed. Julian became increasingly excited by his growing list of LBJ’s which included some lifers – not least the apparently elusive Spike Heeled Lark. And randomly thrown in, were the unusual and the fascinating sightings of puff adder being ushered away by a family of squirrels from their breeding burrows, tortoises, industrious honey badgers and a flock of thousands of European swifts diving, swooping and scooping beakfuls of water at the Sunday Pan water hole – before continuing their journey southward. In fact, the CKGR proved to be a hidden treasure trove of birdlife, which had even the teenagers peering intently through binoculars, poring over bird books, and yelling with delight at every positive ID. We would turn them into ‘twitchers’ yet! Kori bustards were everywhere – as were the proudly purposeful secretary birds. A swirl of ‘smoke’ in the distance turned out to be a flock of hundreds of Amur Falcons feasting on a termite irruption on their migration route all the way from eastern China. We counted 10 out of the 11 larks to be found in the Kalahari (only missing out on the monotonous lark – probably a relief!) and this busy breeding season brought us up close to the nests of crimson breasted shrike and pririt batis. Feathered heaven. Despite the insurmountable heat, the trip was going remarkably well. However, pressure was mounting to find what the kids had come for – big cats! Day 3 required us to relocate to another campsite further south and, with cloud building and the promise of rain ahead, we were grateful and excited to move. In no hurry to get to camp, we chose a more circuitous route to Letiahau Valley, and encountered our first sign of lion tracks, sparking renewed interest in our erstwhile younger spotters in the back of the vehicle. As the morning and altered landscape unfolded, it appeared greener and more luxuriant, with a hint of earlier token rain. 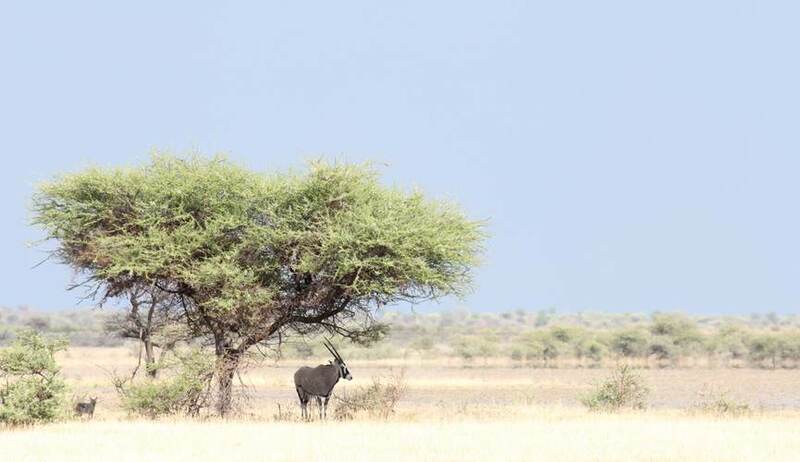 The vast open plains became increasingly dotted with springbok, some gemsbok and even the odd shy red hartebeest. This was indeed more promising, necessitating a welcome lunch stop with cold drinks under a clump of acacia. And then, quite out of nowhere, and shattering our post-lunch reverie, a lone cheetah like a lightning bolt took down a young springbok in front of us. We were frozen mid-munch, hardly taking in what had happened. This thrilling spectacle seemed to initiate a welcome turn of events, thus setting the stage for the remainder of the trip. Journeys of giraffe materialised out of the plains to drink in groups of 12 or more at the water hole, and as miraculously as they had appeared, quietly melted away; we were intrigued and entertained by a small male tortoise attempting to scale the relative heights of Kilimanjaro by trying to mate a much larger female; we nearly missed a lone lizard clutching onto the spiky thorns on the top of large bush in crucifix position, his stark white belly aimed at the prevailing wind in a futile attempt, perhaps, to keep cool. Bat-eared foxes and jackal continued to busy themselves in earnest for who knows what? In any case, these were some of the apparent signs that despite perceptions and in spite of incredibly harsh conditions, there is much life in the Kalahari. Morning broke on the last full day with the cacophonic dawn chorus, and camp staff quietly manoeuvring around our tents filling water buckets and lighting the kitchen fire, bringing with it the delicious sweet smell of smoky brewed coffee. It was at this point that David picked up the fresh spoor of lion scribbled in the sand within metres from our tents. A pride of 9 with youngsters had moved stealthily through under the cover of darkness whilst we slumbered blissfully unaware, inevitably in search of much needed water. With no time to waste, we were in the vehicle and following their clear and deep tracks. It was not long before we happened upon 3 of the larger males at the first muddy water hole, sucking up as much moisture as they could. The rest of the pride were, no doubt holed up in the thickets beyond, awaiting their turn. The gentle early morning light could not have been more perfect as we continued to follow them for some time as they stretched and yawned, rubbed heads, preparing for the inevitable slump under a shady bush for the rest of the day. The signs of drought and much-needed food apparent in the evidence of ribs through their golden hides. On the final night of the safari, the normal night sounds of shrilling crickets and melodious calls of nightjars and owls, were punctuated by the deep guttural roaring of lions and yapping jackal as they hunted and hopefully feasted on a successful kill to keep them alive through the impending drought. An early start confirmed what we had hoped, with the tops of the trees weighted down with flocks of sentinel vultures patiently waiting their turn to scavenge whatever scraps remained. But it was time to leave – and with guests satisfied and lions satiated, we made our way back to Maun in time for their flight home. We prepared for a quiet family Christmas at home. More than just the animals. There is something rather special about experiencing Africa on a privately guided mobile safari with a family. This impermanent and private camp, in spite of its simplicity, provides absolutely everything one might require. It allows flexibilty at all times and there is no greater experience than a fine meal under a star-sprinkled sky, with only the gentle light of a Tilley lamp and a glowing camp fire. What could be better than trying to identify these stars, with the nocturnal sound track of the African bush all around you. This is an Africa I could do again and again.